I’m not sure where I got this recipe, I think it’s the one my mom gave me when I was in college and could only bake two things: this banana bread and the peanut butter chocolate swirl cookies. It’s very simple, the bread is moist, and is great to make when you have some overly ripe bananas at home. Combine sugar, shortening, eggs, and vanilla. Beat until fluffy. Combine flour, baking power and salt. Add to mixture. Put mixture into loaf pan. Bake 60-70 minutes at 350 degrees. 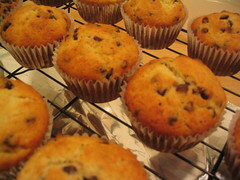 Note: I use miniature chocolate chips, and lightly dust them with flour so they don’t sink to the bottom of the loaf. You can also bake them in muffin tins (makes about 18 muffins) for about 20 minutes. I just made your recipe and it is great! I knew I could count on you for my baking needs! please please please open your own bakery!! you rule! !